After over a month since Phoenix 2 Muay Thai event which took place in Lebanon, this video of the self absorbed Kardashian looking fakeness is still trending. 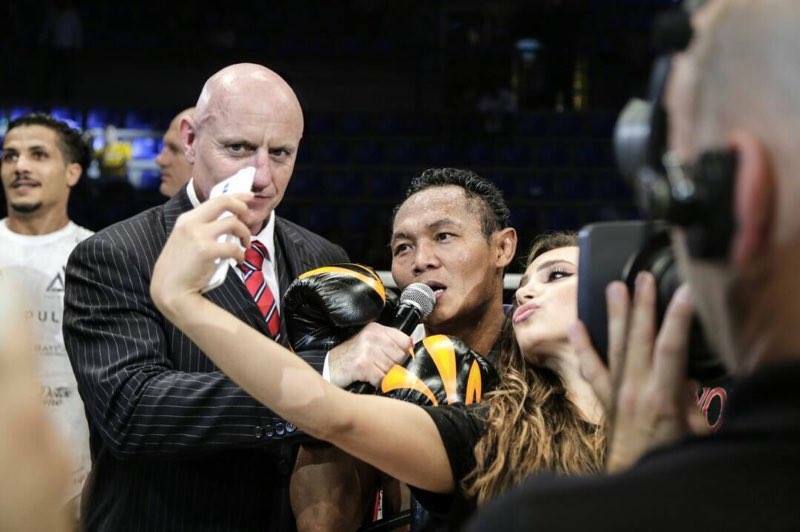 Showing no respect for the Phoenix 2 post fight interview with the legendary and highly skilled Saenchai, she blocked the camera view as she took her time to get the perfect selfie. Obviously not a female who should be around the cage/ring other than in the position of a half naked bimbo ring girl. There is nothing more pleasurable than seeing a female like this shoved out of the way whatever the case. In this case you can see Grant Waterman, the ring announcer, clearly take charge and push her out the way with a blatant look of “wtf” on his face. Watch the full fight below and enjoy the action between Aziz Hlali and Saenchai which headlined the Phoenix 2 event on April 29,2017. PS: If you wait until the post fight interview with Saenchai, you can spot Phoenix matchmaker Louai Kiblawi, kindly asking the girl to move away from the frame. CHECK OUT THIS LINK TO REWATCH ALL THE FIGHTS OF PHOENIX 2.